Volunteers are the backbone of the Cassidy’s Cause program. Previous experience with horses or disabled individuals is not required. CCTRA offers a comprehensive volunteer orientation training program for the care of the horses and the riders. Many willing hands are always needed and welcome to continue helping CCTRA riders succeed. An average riding lesson pairs one rider with three volunteers: a leader for the horse and two side-walkers, plus an instructor. Volunteers are also needed to assist with barn activities, farm maintenance, office duties, fundraising, planning social activities and much more. 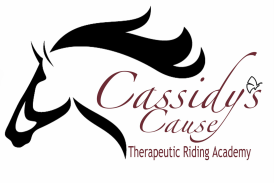 Whatever your skills and talents, you will find a home for them here at Cassidy’s Cause. Join us today! You will never receive more from giving, as you will with our special riders.